- Why do we feel imbalanced, lost so often..? - Diana asked me, wiping tears, - I did so much, have a good education, changed jobs, moved... all to find the special something that will give me calmness and peace. And it all was for nothing! - True..., - she took a deep breath, - but I still don't get why we work so hard, do what we suppose to do as adults and as a result become unhappier! - Because the intention is wrong. - We look for happiness in a wrong place. All your efforts matter, they bring you inspiration, satisfaction, experience. You grow, you learn. But happiness.. happiness comes from a different place. - Hm... makes sense... How do you know that? - I always felt like happiness is something different than we think... since I was a little kid I was trying to understand it and then, as you know, I studied it. We both laughed out loud and returned to the same old question: what is happiness really...? Diana as many women nowadays felt like her efforts, all things she did for others didn't matter. She felt empty, emotionally drained and heavy. Researchers on happiness proved that happiness has a lot to do with meaningful relationships and our contribution to the world. For so many women it comes naturally. The question is what is the missing piece then? Why are we still unhappy? Meaningful = full of meaning. Meaning is a very personal thing; it is a feeling that we give to something based on our unique perception, our one-of-a-kind-story. We can experience it only when we know ourselves and allow ourselves be authentic. Let's be honest, society put quite strict parameters on women, since a very young age we learned we had to look good, study well and overall always be nice. As girls are nice. And Beautiful. And kind. And they can be it all. Until we start making our own choices, we rarely had an opportunity to explore our unique personality, to abstract from girl's duties for a while and discover what was behind expectations that were given to us. Many of us felt lost on the way... But the challenge is: What do we do when we're lost? We Do more and explore less. - This is how you and many of us end up here, - I said to Diana when I finished my story. - First, appreciate your experiences, - I replied, - they brought you where you are. - Then.. explore. Get to know the most important person in your life - You. - Yes, but you feel this way because you're disconnected, but you can connect to yourself, to your inner world or spirit anytime. - And what does happen then, when I connect to myself? - Well... you get clarity on why you do what you do, you bring and feel meaning in everything you do. And if something appears to be not meant for you, you have a courage and energy to change it and explore your unique needs. When you do that, the Universe replies to you with opportunities, connections, the information you need. - Wow... is that why you seem to always be so annoyingly centered and happy?! - Haha, - I laughed, - not always, but Being myself and being with myself gives me a lot of happiness. "Question dogma, question ideology, question outside authority. It is only by questioning what people take for granted, what people hold to be true that we can break through the hypnosis of social conditioning." - Deepak Chopra. Conversations like this, similar stories of so many amazing women I met is one of the reasons I created S.P.I.R.I.T formula and S.P.I.R.I.T formula program. 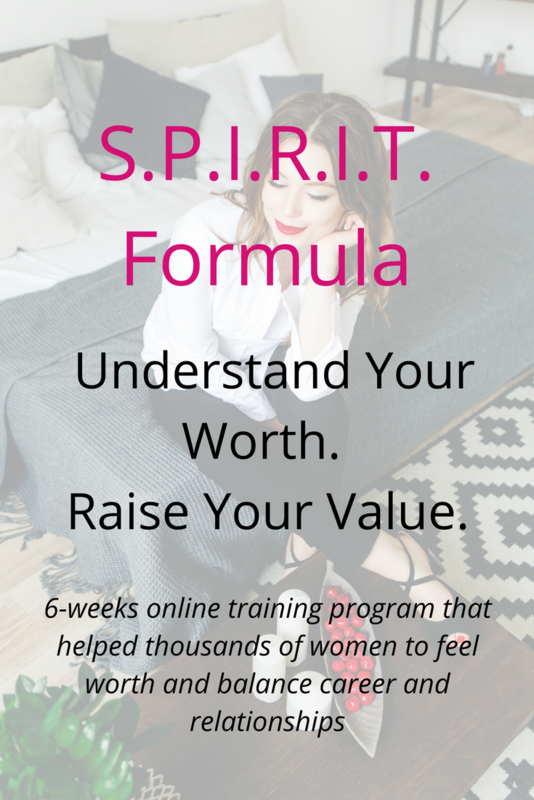 S.P.I.R.I.T formula is about understanding your worth as a driven woman and finding balance. There is nothing more important than connecting with our spirit, knowing who you're. I discovered that for women with a giving, sensitive nature it comes to 6 key steps. As Everything starts with self-love. As finding and recognizing your passion is what helps you to live purposeful lives. Word intuition means inner teacher. No-one knows whats best for you than YOU. And when you start to listen and recognize the inner voice, it helps you to understand your truth fully. Everything you worry about can be solved. You just need the right information to find a solution. When you know how to look for it, you feel confident in dealing with anything. The word inspiration means "in spirit.” When you know how inspiration feels like and how you can access it any moment, your life becomes so much reacher. 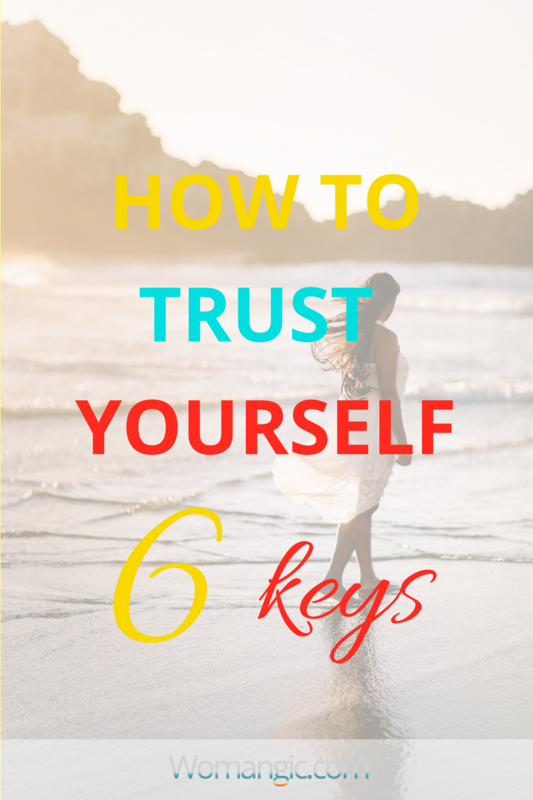 This is the last and critical step when you connect with yourself; you need to learn to trust your own guidance and the guidance of the Universe, listen to yourself and define what you want from what others expect from you. P.S. If you liked the article, you can learn even more principles of trust in S.P.I.R.I.T. Formula Program. S.P.I.R.I.T. Formula helps you understand your worth, feel more appreciated, lighter and happier. A program that will open your eyes to your own worth and power, raise your value, forever changing the way you look at yourself, even the way you express yourself and how you expect to be treated. Guided by S.P.I.R.I.T. Formula you will realize your importance on the planet, experience more appreciation, feel peaceful and empowered, connect with your passionate side. S.P.I.R.I.T. Formula has almost a thousand happy students from more than 20 countries. You deserve to live a life you imagine, but how can you create it without knowing you worth it? As good as S.P.I.R.I.T. Formula is, it's nothing compared to what it could be for You. It's nothing compared with the future - your future - after you know Your Worth, and raise your value, the World responds to you with appreciation and enhanced possibilities you truly deserve.